ANGUS Australia is hosting a series of regional forums across Australia during October, allowing people to catch up on latest technologies available to breeders. 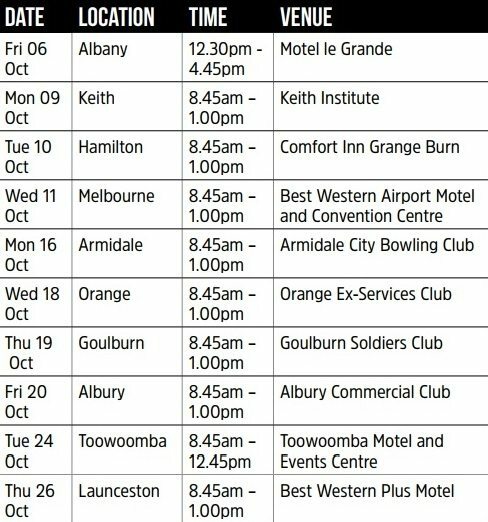 The regional forums (schedule and locations published below) are open to anyone with an interest in Angus cattle and provide an opportunity to catch up with Angus Australia staff and fellow Angus beef producers. The forums will focus on updating members on the latest developments and services offered by Angus Australia, showing how they can be applied to both the seedstock and commercial sectors. The regional forums will also give members an opportunity to provide feedback on what products and services will be of most benefit to their Angus enterprise in the future. The free regional forums will be delivered by Angus Australia’s chief executive officer, Peter Parnell; breed development & extension manager, Andrew Byrne; and Angus BREEDPLAN project officer, Ashleigh Horne. With the exception of Albany (times below), the forums will start at 8.45am (tea and coffee from 8.30am) and conclude around 12.45pm.